Today in Masonic History Robert Samuel "Sam" McLaughlin Passed Away in 1972. Robert Samuel "Sam" McLaughlin was a Canadian businessman and philanthropist. McLaughlin was born on September 8th, 1871 in the hamlet of Enniskillen, Ontario. At the age of 16 he began working for his father's company, the McLaughlin Carriage Works, which his father started in 1867. At one point in time, the McLaughlin Carriage Works was the largest manufacturer of horse drawn carriages in the British Empire. In 1907, McLaughlin, with the help of William Durant of Buick, would develop the McLaughlin-Buick Model F. He would establish the The McLaughlin Motor Car Company that would incorporate in November of 1907. In 1908, their first full year of production they would build 154 cars. In 1910, McLaughlin became a director of General Motors. 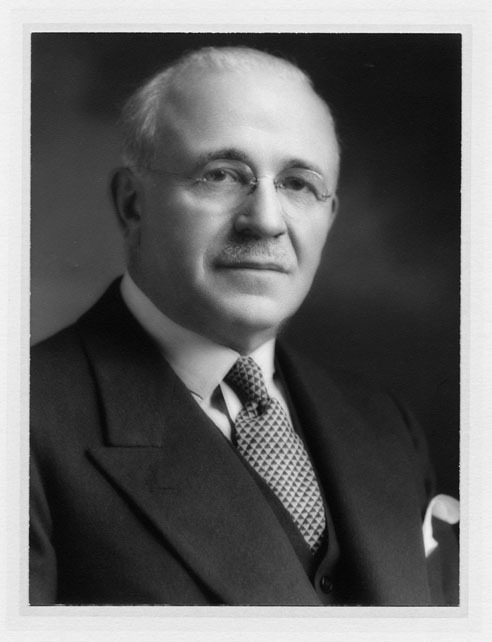 In 1918 he would sell all of his stock in Chevrolet and become the President of General Motors of Canada which continued to sell McLaughlin-Buick models until 1942. He retired in 1945, although he remained the chairman of the board until the time of his passing. McLaughlin's brother was J.J. McLaughlin who founded the Canada Dry company. J.J. would pass away in 1912, Sam would become President of the Canada Dry until it was sold in 1917. McLaughlin was named an honorary lieutenant-colonel of the 34th Ontario-Regiment in 1921. In 1931 he would be "promoted" to honorary colonel. He would serve as colonel until 1967 earning him the distinction of being the longest serving colonel in the Canadian Armed Forces. McLaughlin gave to many colleges and universities throughout Canada through his foundation, The McLaughlin Foundation, which he started in 1951. From 1953 until 2003, the foundation donated $200 Million to colleges and universities to establish libraries, new buildings and to even establish new universities and colleges. McLaughlin also endowed the Regimental Foundation of The Ontario Regiment for the unit which he was an honorary colonel with. He also quietly paid the salaries of the members of the unit when government funding was severely curtailed. McLaughlin also loved horses as a young man and established Parkwood Stable for thoroughbred horse racing and breeding. For his work in horse racing and being the director of the Ontario Jockey Club, McLaughlin was inducted to Canada's Sports Hall of Fame and later into the Canadian Horse Racing Hall of Fame. McLaughlin passed away on January 6th, 1972. At the time of his passing he was more than 100 years old. McLaughlin was a member of Cedar Lodge No. 270 in Oshawa, Ontario.